Hi! I’ve been quiet for a while, but that is because I moved! Not just any move, I left the country and am now expat-ing it up in someplace I actually did a podcast from back in my podcast days. Yes I am in… Singapore! It was very hard to leave Hawaii. Part of what made it heart-breaking-ly difficult was that I couldn’t take any of my animals with me. My cats each went to different new homes and my heart broke twice. They went on separate days. And my chickens… The girls stayed on the farm for the new farm caretakers but my main man, my big sweet boy, my rooster to rival any pet… well… Black Dynamite was a sweet boy who wanted nothing more than to take care of his ladies. Even when they started hen pecking him, and he couldn’t really walk. We were trying to let him go on his own, and made him comfortable in his own little space away from the big hens (who he kept trying to get to come hang out with him….). He was still kicking right before we left so, we called his vet. My bird vet is the best! When I called her after the dog attack took me from 9 chickens to Black Dynamite she didn’t hesitate to treat him like the pet he is. So she came over (house calls too! This lady rocks!) and didn’t say anything about the tears running down my face as we eased his passing. I held his foot and stroked his feathers and said good bye to the best most amazing chicken and bird. My heart broke again. Everything about this move ended up being harder than it should have been. Even as we were flying out we had problems getting our bags to transfer flights. But, as soon as we were away from Hawaii all that changed and it has been much more smooth since we landed. I’ll put that down to the ‘aina wanting to keep us. Speaking of land, that is what I actually wanted to write about. I had started a series about my three layers thinking on connecting to a place. I said it would be interesting to test it in a new place. Boy was I right! In Hawaii I felt like I could really feel the land, get my toes in deep and really feel all three layers and just plug right in. Here? I feel like I am not even penetrating the surface. I am not plugged in yet. But I am getting there. People layer wise it is a very interesting place. Singapore as a city really didn’t exist before the British. I saw something in a museum about how there is evidence that maybe there was a trading city here in ancient times, but when the city of Singapore was founded this spot of the earth just had some small Malay villages. That very early history I want to look more into, but I kind of like to start at the present (what I can see) and work backwards (and looks for the past popping up). Singapore was founded in 1819. It was a British colony, began self-governance in 1959, gained independence in 1963, joined Malaysia in ’63 and was kicked out in ’65. 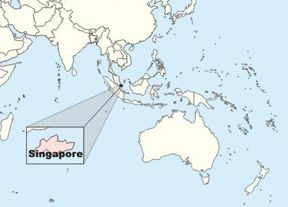 Since 1965 Singapore has been independent and a city-state. It feels like a headlong race into the future with one foot in the past in older traditions. The makeup of Singapore is pretty solidly ethnically Chinese at around 75%, with around %13 Malay and 9% Indian and about 3% everything else (including the expat community). The most common languages are English (Singligh an English creole), Mandarin (and other Chinese dialects), Malay and Tamil. I am still getting used to all the accents and the Singlish. I find it fascinating to watch the code switching as a cashier will seamlessly change from one language to another depending on who is in front of them. Added to this mix of ethnicities and language is an array of religions. There is a large representation of Chinese Buddhism, Hinduism, and almost all the Malays are Muslim. This leads to an amazing array of fashion. I am totally fascinated by the ways the Malay style their headscarves. Also the Indian women are always so colorful with the saris and other traditional Indian dress. The fabrics are just unreal. Christianity is also present in a decent percent along with Taoism. But these don’t tend to have so much a visual impact. There is also a decent percent of the population reports as no religion (third largest group). Needless to say getting connected to the human layer of this city is a pretty huge task. But I am enjoying it. Today I was downtown and I heard a call to prayer from the largest mosque. I have never been near a mosque during the call to prayer! What a cool experience! Also there are small shrines everywhere! I notice a new one on my commute every day. I am interested to see how this mix of religions impacts the secular culture of the city. I will be sure to share photos too. I hope you enjoyed this wander through my exploration of the human layer of my new home. Now that I am starting to get a handle on the present I am going to start walking backwards through time, and seeing where the past peaks out into daily life. Also while I am focusing a lot on the human layer, I have also been exploring the flora and fauna and geologic as well, just not as in-depth yet. We can talk about that more another time.